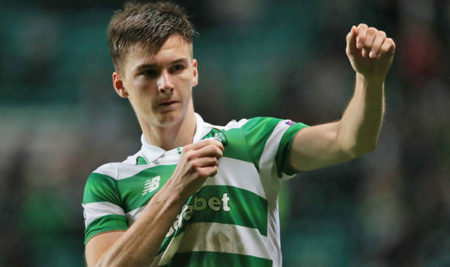 Manchester United have been asked to pay a £30m fee for the signature of Scottish international, Kieran Tierney by his club, Celtic. The left back has impressed at the north of England playing for the Glasgow giants and is attracting interest from The Red Devils. According to The Daily Mail, Celtic have set their asking price for the 20-year-old in a bid to ward off interest from a number of interested clubs as he has become one of the most sought after young players in the European game. United manager, Jose Mourinho is a big fan of the player and wants him to solve his left back problem as number 1 choice, Ashley Young is getting older and has his own limitations. The Daily Mail also report that Tierney is attracting interest from the likes of Atletico Madrid and Tottenham. United are ready to count their losses on Shaw, who has failed to hit the heights expected of him since his big-money move to the Theatre of Dreams from Southampton four years ago. Tierney is a youngster that plays with maturity that belies his tender years. He is strong physically and mentally, having captained his club and country on different occasions. He has won multiple trophies and is adept at defending as well as going forward to help the attack. The fact that he is ready to put in the hard work is a trait that has attracted Jose Mourinho to him, an attribute Shaw is sorely lacking. Despite being only 20, he has experience of playing regularly in the Champions League and will add quality to a United left side that lacks a natural left footer. He broke into the Celtic first team in 2014/15, becoming a regular the next season and developing into one of the best players in the world in his position. He has made 129 appearances for the former European champions, winning 5 trophies including three league titles since making his debut.